Kayaking is something your whole family can do together. Your kids will learn valuable life-lessons like responsibility and accountability, using good judgment and making good decisions, teamwork and respect for the environment, while building self-confidence and a winning character. Unlike team sports, kayaking helps kids develop a unique adventurous identity that will last the rest of their lives. 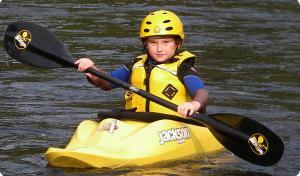 New Mexico Kayak Instruction offers a variety of classes for kids of all ages. Most of our classes follow Boy Scout and Girl Scout merit badge requirements, although your kids need not be Scouts to join in on the fun. We often host clinics for birthday parties, church groups, youth groups, after school programs, participate in Summer camps and other special events just for kids! Younger kids learn best by playing games and having fun. We teach them that a kayak is a toy, not all that different than a beach ball or tricycle. They'll learn to play fun games like Sponge Bob Tag (think 'hot-potato'), Duct-tape Tag and Marco-Polo. Along the way, they develop eye/hand coordination, balance and learn that flipping over is fun, and part of the learning process. Older kids associate kayaking with the freedom, mobility and responsibility of "driving" their own kayak. They learn boat control by setting targets and practicing skills-building drills, such as Kayak Polo and Indoor Slalom. Acquiring basic paddling skills, while learning how to identify and correct improper technique, manage risk and perform simple rescues, making future outings much more fun and enjoyable for everyone! Adult leaders give their younger troops security and confidence to challenge themselves in unfamiliar situations, and make those challenges a lot more fun! Kayaking is a Team sport and something the whole troop or family can do together. Troop leaders and parents can participate at a significant discount from regular adult classes. Currently there are no Girl Scouts clinics scheduled. Please see our Calendar of Events for upcoming Intro, Roll, Whitewater and Touring clinics, or Contact Us for a private lesson.